I very nearly wasn’t going to post anything this month. After the madness of the A to Z Challenge, I was fully prepared to just post a picture of my cats and call it a month. But, during the very same challenge, I met Rhonda Parrish, and she was looking for folks interested in participating in a cover reveal. I thought the book sounded interesting, so I signed up. And while I am mildly disappointed not to be sharing a picture of my cats, I am very pleased to share the cover of this upcoming short story anthology! Alexis A. Hunter – As an author — ‘acceptance’ has a beautiful ring to it. As a sci-fi writer — ‘apex’ is particularly engaging. In general — ‘angel’ is one of my favorite words, because they’re one of my favorite ‘creature types’ to play with in stories. Plus I have a thing for wings and feathers. 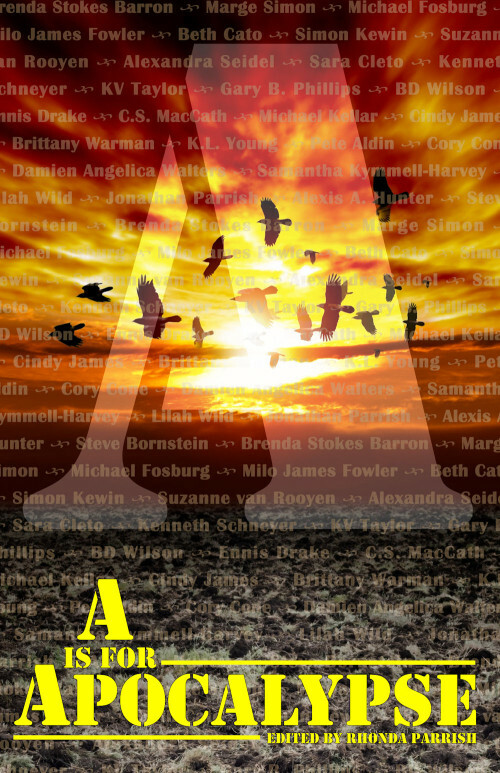 Rhonda says: I’m giving away three ARC copies of A is for Apocalypse (tour-wide). These are physical copies but I am willing to ship them to anywhere in the world. The Rafflecopter draw will run from May 12th to May 19th. On May 20th I will choose three winners and email them in order to get their shipping address. Anyone who doesn’t respond by May 27th will forfeit their prize and I will choose a new winner to receive it. In part one of this post, I shared the black and white images of the cover art for my book, The Thirteenth Tower, drawn by the talented artist, Ferdinand Ladera. Now, in part two, it’s all about the colored versions. Most of the color studies are featured in this post, but not all. Some of the changes in a few of the images were so subtle that it seemed unnecessary including them. It was nice, but kind of glum and hazy, and there was no snow on the trees. I, being a busybody, had also noticed that in some of Ferdinand’s other work the sky often had different shades of color and I wondered if something similar would work here. So I asked him to toy with that along with the color of the ivy on the ground, just to see if something interesting could come of it. It backfired, and further solidified my suspicion that I really don’t know what the heck I’m talking about. I told him to ignore me and just keep on with the coloring like a sane person. So the weird coloring was fixed, as was the ivy on the ground. Originally it had a dark shadow behind it that wasn’t really visible in the black and white version, but in the colored version it didn’t look quite right. So he removed the shadow and reworked the ivy a bit so it was more like tendrils twining along the ground. After that, it was just a matter of tweaking the background for less haziness and more clarity. It was pretty much spot on. It looked great and, thinking it was what I wanted, we said that it would be the final image. So Ferdinand increased the resolution to our requested specs, added more detail, and sent the image to us for one final approval. But I couldn’t give it. In the few days that passed between receiving the final image, I had this nagging feeling that the picture just wasn’t quite right. It was weird, because it was exactly what I asked for, yet I didn’t know if it was right, if it would make a good book cover. So, Anders (my boyfriend and partner in crime publishing) shrunk it down to paperback-sized proportions, printed it out and wrapped it around a book. We then propped it up on a shelf and stood back to look at it. I’ll admit, after doing that it did look better. And it was kind of cool seeing it in book-form. Exciting. But in doing so, I realized one thing I didn’t like about it: it was too… blue. Now, it was only that blue because I asked Ferdinand for vibrant color, and he delivered. At this point, though, I honestly had no idea how to fix it. I mean, I didn’t really know what I wanted anymore, so I wasn’t sure how to proceed. So, we went to a fantasy and sci-fi bookstore to do a bit of recon on other book covers. Now, I always knew my cover would be a bit… abnormal. Most covers have people, but I specifically didn’t want a person on mine. Going to the bookstore just reinforced what I already knew: most book covers have people. It was encouraging, though, because some of the book covers were… well… let’s just say that even with an electric-blue sky, I still think my cover looked better than some of them. Anyway, I wandered among the shelves for quite some time. I paid particularly close attention to the few covers that had landscapes, trying to see similarities and how they could be applied to my cover. One thing that stood out was that there was usually a fair amount of open space/sky. There was also a prominent feature somewhere, like a castle or animal. 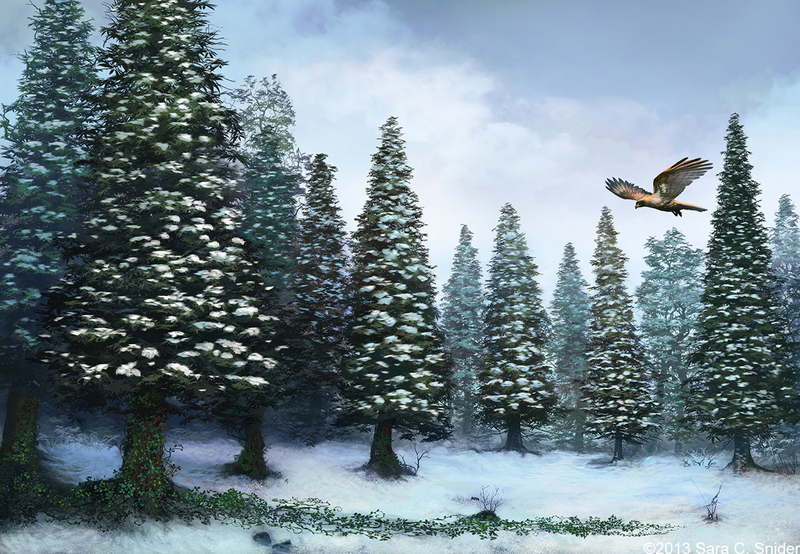 Looking at my cover I realized that the trees were too high, and the falcon too small. We were then faced with a conundrum. Do we try to fix the picture as is, or scrap it completely and start over? Wandering through the bookstore gave me an idea for a cover that was completely different than what I had. Should I pursue that instead? It was a hard decision, as I think both types of cover could work. Not wanting to completely abandon the original idea, Anders and I sat down and manipulated the picture in Photoshop to reflect the needed changes as best we could. We added text for the title and my name and everything, trying to get it looking like a book cover. We wanted to see if there was still potential for a cover that we both liked. I’m happy to say, there was. So we mailed Ferdinand and explained the changes we wanted, and sent him a copy of our manipulations to illustrate what we meant. I was really worried that Ferdinand would be upset, that he wouldn’t want anything more to do with us. But he was super nice and said he’d be happy to do it. A definite improvement. The sky was still a little too dark, and the falcon a little too small. I wanted some cloud textures and we played around a bit with the color of the falcon. And there it is, the artwork that will serve as the cover for my book. Part of me is still unsure if will be a good book cover. I don’t know if it has that “oooh” factor that will draw people’s attention. But I love it, so that will be enough for me. Designing the cover art for my book was a fun, and educational, experience. It was something of a luxury, having a vision of what I wanted yet letting someone else do all the hard work to bring it into being. In this case, that someone was the talented artist Ferdinand Ladera. I must say, it was a pleasure working with Ferdinand. I was a rather picky client, and he obliged my finickiness with good humor. However, during the process one thing became stunningly apparent: I don’t know the first thing about designing book covers. If there is one lesson that I took away from this experience, it’s that a pretty picture does not necessarily result in a good cover. But, as the chatty “they” are so fond of saying, “a picture is worth more than a thousand words.” So I thought I’d share the process with you, from the early sketches down to the final result. To keep this post from getting too unwieldy, I’ve decided to split it into two parts. In part one I’ll share the black and white sketches. Part two will feature the color studies and the final image. The second part will be somewhat longer, as there are more colored images than black and white ones. There were also some setbacks on the path of finalizing the image, but I’ll talk about that later. For now, let’s look at the sketches. My first thought was, “wow.” Had I been forced to settle for one of the pictures as-was, I would have been pretty happy, even with it in black and white. But this was just a first draft. So I considered what I liked and didn’t like about both pictures. That was really hard. Both pictures were good, each having its own strengths and weaknesses. The result was that I liked the trees in one picture, but liked the falcon in the other. I didn’t like all the birds in the sky, as it made me feel like there must have been a dead animal somewhere (which is probable, given it’s a forest, but not relevant for the purposes of the cover). I also didn’t like all the bracken on the ground, as I felt it made the forest look much harsher than I imagined and also might be too cluttered for the purposes of a book cover. There was also the ivy missing that I wanted on one of the trees. Ferdinand took the feedback and provided the third sketch. And there it was. The picture I had in my mind (or near enough, anyway), now sketched in black and white. I loved it. It had that calm, quiet feeling that I was looking for. I’m honestly still kind of amazed that Ferdinand was able to capture what I wanted so quickly. I approved the sketch and we moved on to the color study. Please stay tuned for part two where I’ll share the colored versions of the sketches, and the bump in the road when I realized that a book cover needed to be more than just a pretty picture. Not to mention, of course, the final image that will be the cover of my book, The Thirteenth Tower.